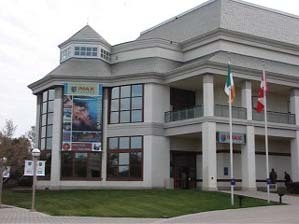 The Imax St Augustine, is in the heart of the World Golf Village complex and is open to the public. With a screen 6 stories high and 8 ft. across, it wows everyone in your family with the immense picture and clarity of the image. We saw a double feature, "Under The Sea" and "Dinosaurs". Each movie is 45 minutes long, which is just right for anxious little ones who have lots of sillies to get out. Under The Sea, was a breathtaking adventure all about the undersea world. I say breathtaking, because I found myself holding my breath while watching some of the underwater scenes! The scenes were so real, I was looking over to Bryan and he was holding his breath and swimming with his arms! Hysterical! After the movie, you can take your little ones strolling around the brick path around the lake. There is a children's playground off to one side where they can play for a while. There are also fish feeding stations where you can get a handful of fish food for .25 and feed the catfish and carp. There are picnic tables available, so you can come early and bring a picnic lunch. What a wonderful way to spend the day!